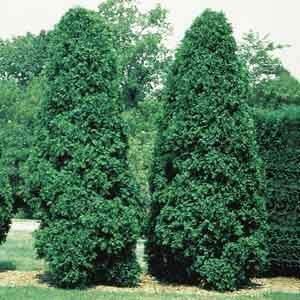 Dense branches of deep green foliage and a compact, pyramidal form make this an excellent evergreen for providing year round beauty in smaller landscapes. Also known as Smaragd Cedar or Smaragd Arborvitae. Dense foliage makes a great informal hedge row or privacy screen. Perfect for hedges or narrow spaces. Beautiful grouped or massed in a shrub border.